LAS VEGAS -- Park Jung-ho, chief executive officer of South Korea’s No. 1 mobile carrier SK Telecom, on Tuesday expressed determination to create an intermediary financial holding company this year. After setting up the intermediary holding company, “SK Telecom will turn into an operating company and go public again through an initial public offering in order to attract investors,” Park explained. “That scenario would help raise funds to buy more stake in SK hynix,” the CEO said. SKT has been preparing to adopt the holding company system -- dubbing it an “ICT holding company -- through physical divisions of each business unit. 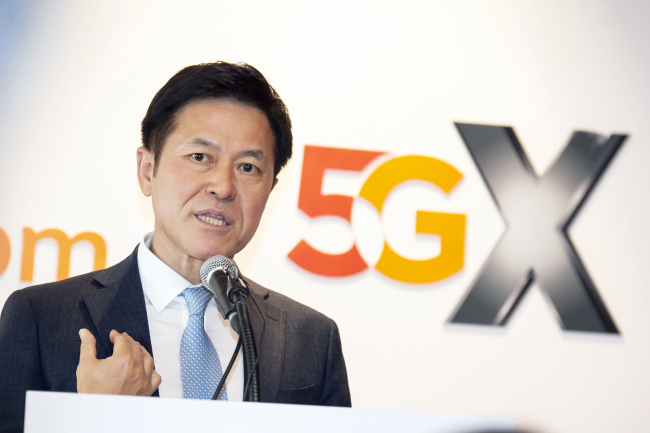 Under the ICT holding firm, Park plans to have the mobile network business, security, media and commerce as subsidiaries, and expand each subsidiary even further. If SKT becomes a holding company, it must own at least 30 percent stakes in its subsidiaries under the revised fair trade law. It is estimated that SKT should secure around 6 trillion won to purchase an additional 10 percent stake in SK Hynix.